You know what’s better than eating cherries straight out of the bag for lunch? These individual galettes are not your average dessert. 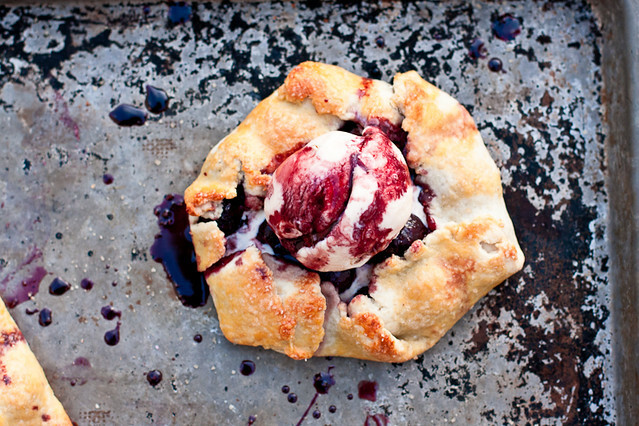 The rustic pie/tart/pastry-thingies are filled with red wine-soaked cherries, glazed with a red wine reduction, and then topped with a scoop of vanilla ice cream. It tastes like someone (me) spiked a cherry pie with wine (because I did). And they couldn’t be easier. You take a dough circle (full disclosure: more like rounded squares and octagons), fill it with drunken fruit, and then fold the edges in. And sure, you need 2 hours for the recipe. But 90 minutes of that is actually you just drinking wine while watching Top Gear reruns. 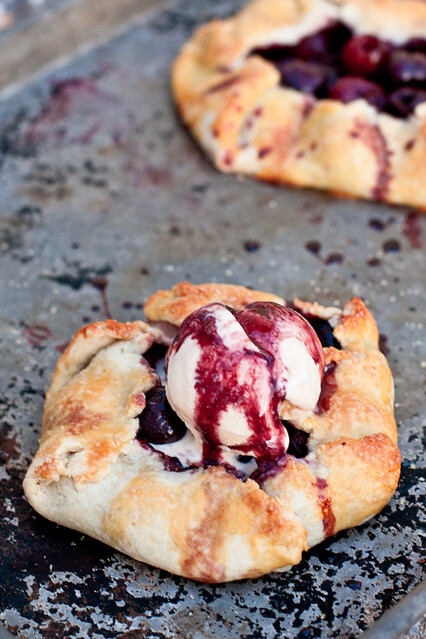 A buttery, flaky galette filled with red wine-soaked cherries. Cut in the butter (by hand or machine) until the mixture is crumbly and the butter is mostly the size of peas. Add 4 Tbsp water and mix, adding the last of the water 1 tablespoon at a time only if needed to make the mixture hold together when pinched between your fingers. Turn out onto a sheet of plastic wrap and pat it together into a disc. Wrap tightly and refrigerate for an hour. Pit the cherries and place in a shallow dish (I used a pie plate). Pour over the wine, lemon juice and zest, and sugar, stirring to mix well. Let sit one hour at room temp (longer is fine). Set a strainer over a sauce pan and pour the cherries into the strainer, scraping any undissolved sugar from the bowl, and drain well. Remove 1/4 cup of wine and set aside. Simmer the wine mixture in the pot until thickened and reduced to about 1/4 cup. Sprinkle cornstarch over the cherries and add the reserved 1/4 cup wine, stirring until well mixed. Divide the dough into 4 equal pieces, roll out on a floured surface into a circle, and mound 1/4 of the cherries in the center of each circle of dough. Fold the edges towards the center and drizzle 1 Tbsp of the liquid left in the bowl over each dessert. Bake for 25-30 minutes, until bubbly and golden brown. Brush wine reduction over the fruit in each tart, top with a scoop of ice cream, and drizzle with more wine reduction. Wine-soaked cherries? Red wine reduction?? I’m sold!! These look so beautiful in their rusticity, and I laughed at your definition of galette – so true! Oooh! I’m a bit of a drunken cherry addict in the summer time. 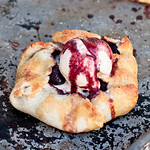 I normally just spoon them over ice cream, but I quite like the sound of this galette! Boozy cherries sound good to me! 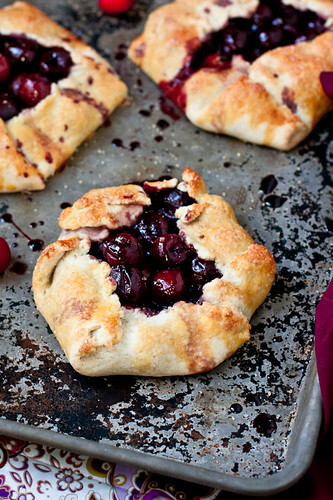 And boozy cherries encased in a flaky crust sound even better.